Power Civics, our college level curriculum component, combines the basic elements of Solutions Civics with more advanced guidance on how to devise and successfully implement a solution to a city issue. The Power Civics curriculum component includes a student service activity that asks students to plan, organize and host a community-wide forum that allows students to introduce and share information they’ve acquired in Power Civics training with others. Online Power Civics was designed for use directly by the general public. It was developed by experienced practitioners in local government in partnership with professors who are experts in the emerging discipline of “beyond the ballot” civic engagement, The Citizens Campaign’s Online Power Civics provides citizens with the tools to become active and informed participants in government problem solving and decision-making. 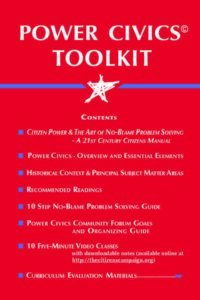 Citizen Power & The Art of No-Blame Problem Solving provides basic training in the use of 21st century citizen powers. 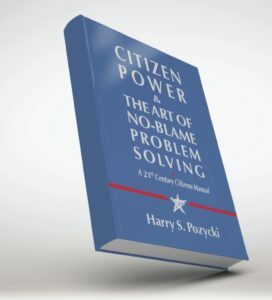 This 21st Century Citizens Manual contains a proven step-by-step guide for No-Blame problem solving that incorporates the strategies and tactics of highly successful practitioners who have navigated the maze of city and school district government. Citizens who have used this guide have passed over 300 cost-effective, evidence-based local laws with a success rate of over 90%. Download the manual below or order a hard-copy from our catalogue. I took The Civic Pledge! Click on the link to access our Menu of Solutions listing, with resources, of solutions that regular citizens have passed to better their communities.